Follow the fictional, humorous and incompetent detectives as they bumble their way from reel to reel in the fun Keystone Kops online slot by IGT! This game has 5-reels and 30-lines of action while offering some great bonus features. Trigger the Pilfering Pooch or Pie Patrol free spins for some high action spins or watch the reels go crazy in the Scuffle Shuffle Feature! Scuffle Shuffle Feature – The reels go crazy whenever a stack of these symbols fills the middle reel. Symbols upgrade and shuffle up to 5 times, for frequent big wins! Bonus Triggers – Trigger one of three bonuses with a bonus symbol on reels 2 and 3, plus a bonus game symbol on reel 4. Progressive Picks Bonus – Open vaults to find three matching symbols and win a progressive or jackpot prize. 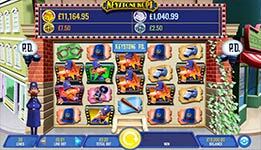 Pilfering Pooch Free Spins – Each bone symbol on the 8 high reels triggers the snaking wilds feature. Pie Patrol Free Spins – A Hat symbol anywhere on the middle reel turns the whole reel wild, triggering the random wilds feature.